Social Network Protection Filters the links you receive from your social networks friends and monitors your privacy settings. USB Immunizer Immunizes Flash Drives from viruses when connected to your PC. Parental Control Blocks inappropriate content, restricts Web access, and helps you remotely monitor your children''s online activity even on Facebook! Two-way Firewall Monitors your Internet connections, and keeps strangers from accessing your Wi-Fi connection. 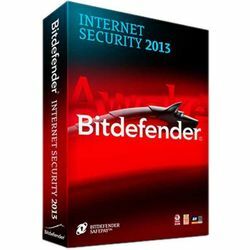 Defends against viruses, spyware, spam, and ID theft attempts Keeps kids safe with cutting-edge Parental Controls Guards your Wi-Fi connection with a two-way firewall Protects your privacy on social networks Gives advance warning of risky websites Windows 8 compatible Bitdefender Autopilot Quietly makes all the security related decisions for you allowing you to play, watch movies, or simply enjoy your PC without interruptions or slowdowns. Bitdefender Safepay Keeps hackers at bay by automatically opening all your e-banking and e-shopping pages in a separate iron-clad, secure browser. Social Network Protection Filters the links you receive from your social networks friends and monitors your privacy settings. Antiphishing Blocks websites that support various scams or credit card phishing attempts Search Advisor Gives advance warning of risky websites right in your Google and Bing search results. USB Immunizer Immunizes Flash Drives from viruses when connected to your PC. Parental Control Blocks inappropriate content, restricts Web access, and helps you remotely monitor your children''s online activity even on Facebook! Antispam Stops unwanted e-mail from ever reaching your Inbox Two-way Firewall Monitors your Internet connections, and keeps strangers from accessing your Wi-Fi connection.